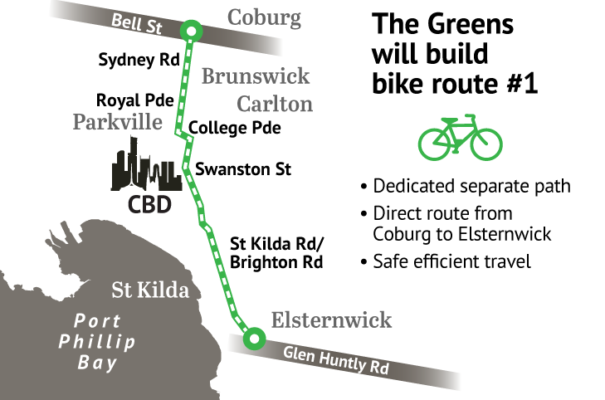 The Victorian Greens have unfolded a $250M plan to boost bike riding, including the immediate roll-out of the top priority, 17km continuous bike corridor from Coburg to Elsternwick along St Kilda and Sydney Roads. The route is vital for getting commuters on bikes to jobs and education in central Melbourne, and has long been top of the investment list for bike infrastructure, but progress has sputtered under the Andrews Government. Now the Greens, who could hold the balance of power in the next government, say they will make it happen. The party also wants to see a Metropolitan Bike Network, including Strategic Cycling Routes which connect major destinations, on-road separation where possible, upgraded bike lanes and enhanced off road paths. rolled out as a single project over the four year term of the next government. The Greens have committed to a $30M expansion of Melbourne bikes share to include the municipalities of Port Phillip, Stonnington, Moreland, Maribyrnong Darebin, Moonee Ponds, Hobsons Bay and Yarra. Another $10M would be dedicated to Regional Bike Tourism. The Greens want to realise tourism and recreational opportunities in cycling through scenic parts of the state, delivering experiences and income to regional areas. Investment in road and mountain bike cycle trail infrastructure. Investigating the returning to service of a dedicated rail carriage to hold bikes available for hire by cycling tours. Ensuring sufficient cycle storage is maintained in train & bus services. Investigating a booking system for bike travel (with passengers) on rail/road services. The Party says previous governments have cancelled bike education in schools, reducing road awareness. To teach children road safety skills, the Greens will re-introduce practical bike safety education in primary schools. Women are under-represented with cycling. The Greens will work to develop & implement strategies to deliver safe cycling opportunities for women. The Greens will also initiate an extensive TAC cycling safety campaign to make drivers and cyclists aware of their rules, rights and responsibilities on sharing the road, and a Parliamentary Inquiry of existing cycling laws focusing on the safety, accessibility and barriers to cycling.